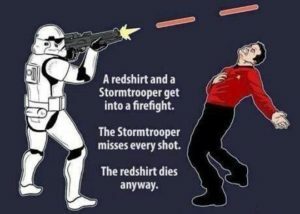 The age old question, what’s the best science fiction franchise, Star Wars or Star Trek. We review Rogue One as well as Star Trek Beyond. Why is the Star Trek reboot series so awesome? Listen and find out. What’s the best Star Trek series? Did you say TNG? You’re absolutely right. Next Post Super Fantastic Terrific Show #23 – Gameover Man!